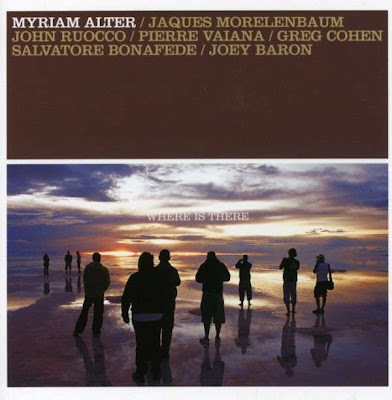 As on her last two albums, Myriam Alter doesn't play the piano herself on her fifth record, she "merely" composed eight songs and assembled a sextet to perform them: bassist Greg Cohen, drummer Joey Baron, clarinet player John Ruocco (these three were also on her last album, IF), pianist Salvatore Bonafede, cellist Jaques Morelenbaum, and soprano saxophonist Pierre Vaiana. And even though she doesn't play a note on the album, her presence is strongly felt at any given time in the compositions that encompass jazz, classical music, and various European influences. The rhythm section is at the heart of the record -- listen how effortlessly Cohen and Baron provide a rhythmic bed for the other musicians, and how Bonafede provides just the right amount of texture on top of that -- but the defining sound of WHERE IS THERE is Morelenbaum's bittersweet cello, giving the songs a wealth of different moods. The record feels "light" in the best possible sense of the word: the music possesses elegance and clarity that turn each of the tracks into a gem. From the joyful opening track, "Was It There," to the somber "September 11," the album is very visual and invokes a great number of images. Wherever the album title's "there" is, the journey is a rewarding experience. This review was written for the All-Music Guide on June 24, 2008.